CARE grantee and valued recycling partner Planet Recycling (Chula Vista) has been awarded the 2017 Bow & Arrow Award for Coalition Building, presented by the California Product Stewardship Council. The custom-designed award, made of recycled materials by Bay Area artist Ellen Blakeley, was presented at CPSC’s Arrow Awards ceremony on August 22 at the California Resource Recovery Association Annual Conference and Tradeshow in San Diego. The annual Arrow Awards recognize innovative product stewardship programs, and outstanding partnerships in product stewardship, and serve to inspire organizations to integrate principles of product stewardship in their operations. Their partnership with two San Diego landfills to promote carpet reuse and recycling by directing it to manufacturers or remanufacturers. Their work with Habitat for Humanity’s ReStore, to which they supply carpet for reuse in support of the non-profit’s mission. 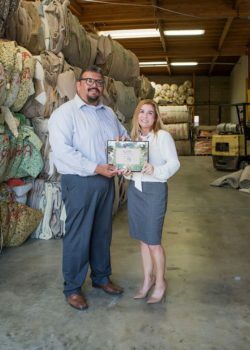 Their extensive stakeholder education efforts, informing consumers, retailers, installers, homeowners, city agencies and contractors about the opportunities and benefits of carpet recycling. Planet Recycling has been an active participant with CARE since its inception. Owner Rachel Palopoli serves on the California Council on Carpet Recycling. The company received a Micro-Grant this year to purchase four 40-yard roll-off containers to increase localized collection of post-consumer carpet at retail sites in San Diego. CARE has awarded grants of $10,000 each to five companies for its Cycle 1M Micro-Grants for Collections/Reuse Programs pilot. Funds were awarded for infrastructure projects and/or purchase of equipment that supports the operational logistics of properly collecting and/or reusing California post-consumer carpet (PCC) under a new or established program. Projects must be completed by the end of 2017, and are expected to support over 15 million net new pounds of collection annually. A-1 Planet Recycling, Chula Vista: To purchase four 40-yard roll-off containers for San Diego localized collection at retail sites. CLEAR, Lincoln: To purchase 20 sea containers for Sacramento localized collection at small and medium retailers. Green Waste Recovery, San Jose: To purchase a MicroPHAZIR gun to identify PCC types more rapidly and increase throughput into the facility. Napa Recycling and Waste Services: To purchase a rain/weather cover to increase PCC diversion by 30%. Zanker Recycling, San Jose To purchase a rain/weather cover and cement pad at the Florin Perkins site in Sacramento to increase PCC diversion by about 33%. To learn more, visit the Grants webpage.